The long wait is finally over and blogger has come up with it’s own contact form. Now you no longer have to rely on 3rd party Contact form solutions. 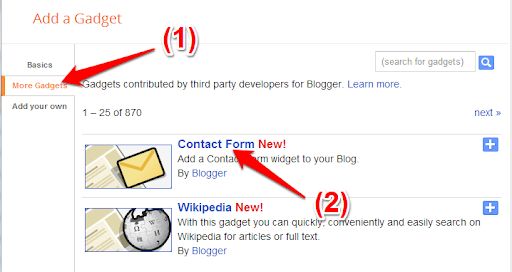 Blogger has added a new Contact Form Widget which will fit into your Blog’s sidebar. 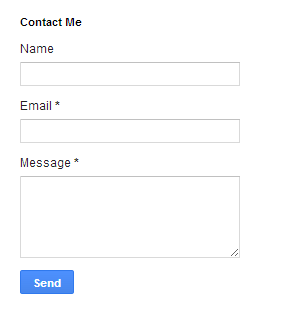 You can also add the same contact form on a separate page and customize it if you want to. 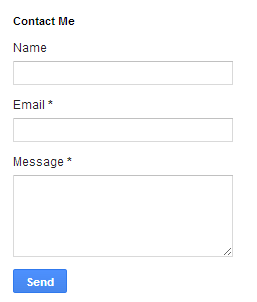 Adding a contact form to Blogger is now really easy. Below steps will guide you in adding the contact form as a sidebar widget. Visitors can easily drop a message to you straight from your blog. You don’t have to reveal your email address to the web to provide users with an option to contact you.If you like getting suggestions, queries or any other feedback from the users, make sure that you add the contact form to your blog. It’s really easy to add the form and doesn’t require any 3rd party code to be added to your blog.It also makes it really easy for your blog readers to contact you directly. You can set an appropriate title for the Gadget and Save it. Below is the screenshot of the Contact Form Widget added to one of my test blogs. When the reader sends you a message via the contact form, you will receive it straight in your inbox. Copies of this message will be sent to each admin user of the blog. Below screenshot will give you an idea of how the message will look like. You can directly reply back to to the sender from you email. If you want to move the Contact Form to a separate page, then checkout the tutorial on creating a separate contact page for blogger. You can change the look and feel of the contact form by altering the CSS styles. We will try to publish another tutorial which will help you in customizing the contact form. You can see a slightly customized version of the contact form widget on our Contact Page. How can I add this form to any page or post of my choice?. I mean how can I get the code? I added it to one of my blogs but I think it's a little large on average. if you think that it's too big for your sidebar, you can move it to a separate page. Tutorial link is there to the end of this post. It was most awaited as i was using third party widget in my blog because of unavailability of contact page and third party contact page form always comes with limitations which is not good for me.and finally blogger itself launched it.thanks to google.One quaetion can i add it to a separate page then adding as a gadget. please read the last part of the post or the previous comments. How to force this Contact Form Widget to send to another email....(no email Blogger). Add a new author from Settings > Basic > Add Authors.Once the author accepts the invitation, mark him as admin. All admins will be copied in the emails sent via the contact form. Welcome. Question: I put in my blog >> widget Contact Form. Can I put another adress email ? >> to redirect messages . Where? How? Go to your gmail account (or whatever email is set as your primary author under Settings/Basic). If using gmail, click the "social" tab at the top of the page. Your test message should appear there. When i tested this i noticed when i replied my real name was shown. Is there a way to change it to my username here on Blogger. i cant found te contact form in "more widgets"
Nice info.........m search for this from a long time....Thanks google.. There is just Name, Email and Message option. I want to add some new option and also dropdown menu. is it possible ? Added it but no emails are getting through. Advice? Does it show the "Your message has been sent" message. If so it might probably have ended up in the spam folder of your mailbox? Though earlier (an year back) I followed the same steps and it worked for another website. Please suggest if I can see debug info. I am not able to receive the mail from contact form? Have you figured it out at all? Its driving me nuts! It sent one email the first night and nothing since. Sometimes I even get a message that reads "message sending failed try again later". But most times It says it sent and yet I never receive anything. Does the contact form display a message which says something along the lines of "Your message has been sent" ? It doesn't work... "Message has been sent" but no email at all... Spam checked. Where are those messages? I really don't know. I had left a comment a little bit ago. I found a work-around with a short piece of code. Everything's fine now. This mostly looks like an issue at the Blogger end. I'm not receiving my messages, do you know why? This acts like it does not know where to send it. My non-Google email seems to be set up in the system The "comment section" seems to work, but I can't really reply directly the sender like the typical "Mail to." This just gets stuck and goes nowhere. I'm not receiving any emails from my blog at all. Most Aprils, I'd have had about 100 queries about my business. This year - about 2. Traffic to the blog is still good. I'm racking my brains to work out what has happened, as it's having a terrible effect on my business! I don't have a contact form. People have always got in touch by emailing me. I'm another of the email sent but nothing arrives people. Haven't seen any responses from you Aneesh since January. Is anything happening to rectify the problem? I set it up on my Contact Page - looks great - but when I sent a test email, it never arrived. It said Message Successfully Sent but it never appears in my google email which is my Admin. email address. Any idea why?